This is a 2-in-1 combo edit of Robocop 1 & 2. Trying to make a rollercoaster of both movies. 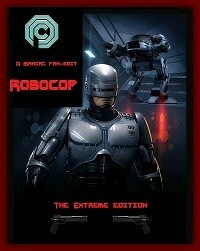 First off like pretty much everyone else I love Robocop. The second one is not as good (obviously) but I still really enjoy it. The stop-motion is fantastic. So about this edit. I loved the new intro, it was really powerful. The video quality was great. Unlike my review of manic51's Terminator Fanmix I didn't think this fit well as a one shot. The stories while similar in tone (or bent that way) don't mesh that well. It's not the editor's fault but it seemed off somehow. Maniac51 is a fantastic editor and I look forward to more of his work. Robocop is a movie i have always enjoyed and Robocop 2 is a movie i struggle to get through, it just lacks that certain something the original has. It was with fingers crossed i settled down to watch this edit hoping that a streamline Robocop 2 combined with Robocop would work but for me it was not to be. Maniac51's work is really good, both in edit choices and quality of work and the Robocop segment of the edit was great fun and Maniac51's vision of a rollercoaster ride was achieved, no dreams for Murphy, no family just action all the way. Now we come to the second half of the edit the bit that contains Robocop 2. I really wanted this to work. I was prepared to overlook the change in Robocop suit colour, after all he was damaged during the last action sequence of what was the first movie so he gets fixed and the armour is slightly different, but as hard as i tried even in it's trimmed down state it was still Robocop 2 and the content seemed so much weaker than the first half of the edit. The quality of the editors work was still of a high standard but what he had to work with was just too below par. Like all reviews this is just a personal observation of an edit that was well made, so would i recommend it.....Yes. Give it a try and see what you think.